SANTA ANA, CA (Nov. 16, 2014)- Orange County Blues FC defeated El Salvador Primera Division Club Deportivo Atletico Marte 4-2 in an international friendly match Sunday at Santa Ana Stadium. The first half of the game was played back and forth, until a goal by Atletico Marte in the 22nd minute of play, scored by forward Cristofer Ramirez. Ramirez was able to put C.D. Marte ahead by receiving the ball into the back of the net by receiving the ball from a corner and shooting it right past the Blues’ keeper, Trey Mitchell. The Blues turned on the pressure, not wavering from Marte’s lead. Orange County’s perseverance paid off as they knotted the score just before half time. Assisted by Jose Gomez, forward Mackenzie Pridham slotted the ball past Marte goalkeeper Javier Gomez. Coming back from halftime both teams continued to press on, hoping to break the tie. Blues midfielder Christopher Santana had an early chance on goal. His low shot beat the goalkeeper, but it trickled just wide of the right post. After the halftime break, the home team wasted little time in finding a go-ahead goal. Santana received a pass in the 52nd minute that allowed him to shoot into the bottom right corner to put the Blues ahead. Not ten minutes later, Brenton Griffiths headed in a corner to put Orange County up 3-1. As the game continued, neither team was easing up. The Blues knocked in their fourth goal from a corner-kick. Marijan Jurac’s ball ended up in front of defender Jeffrey Payeras, who fired a shot from the left side past the diving goalkeeper. Marte continued to fight on non-stop, and kept pushing for another goal. Manuel Otero headed in an impressive cross from Allam Fernandez to pull one back for the visitors from San Salvador, but it was not enough as the final whistle blew, with Orange County taking a 4-2 victory. 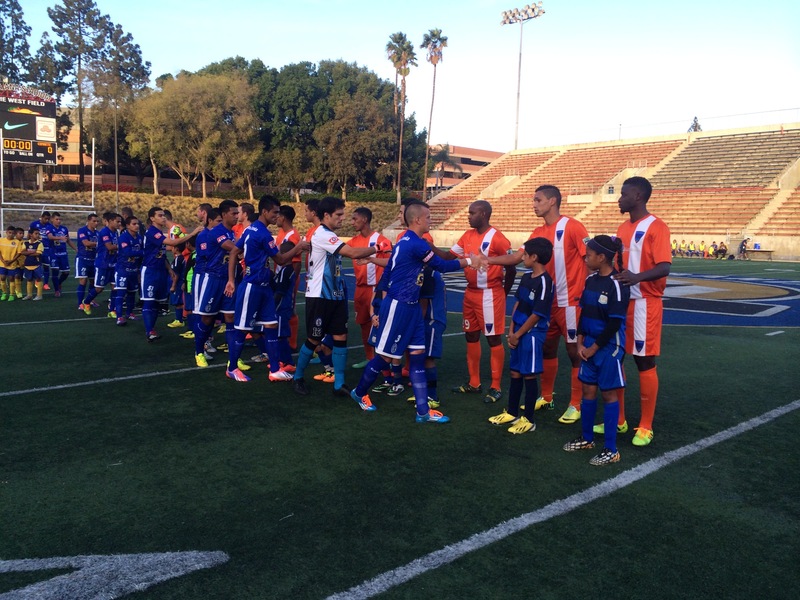 The international friendly drew 1,684 to Santa Ana Stadium in Downtown Santa Ana. This was the first offseason test for the Blues in their preparation for the 2015 season.